"Yah really, they throw fish there!". My kids were in disbelief that someone would actually throw a whole salmon 20 feet to a willing recipient. Call it a gimmick, but the kids wanted to see for themselves whether I was pulling their legs or not. So off we went down to Seattle for a couple of days. Our first stop - Pike Place Market and the fish-throwing. Okay, there wasn't much happening when we stopped by. In fact, no one seemed to be buying any fish and the staff were just chillin' out... Not until some lady slipped them some cash... They threw an honorary fish for her daughter to see. As a by-product, my kids got to witness the flying fish. Okay, been there, done that. Now what's to eat? 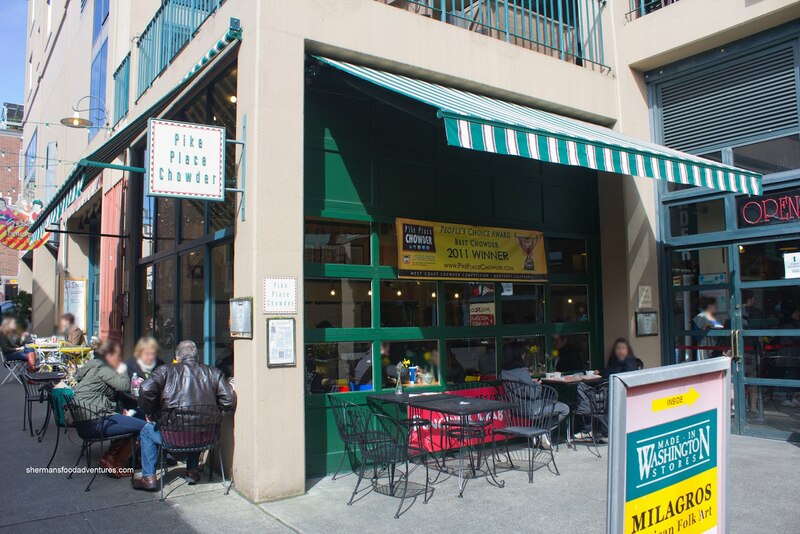 Keeping it simple, we headed over to Pike Place Chowder to do the touristy thing (we've been here before though). 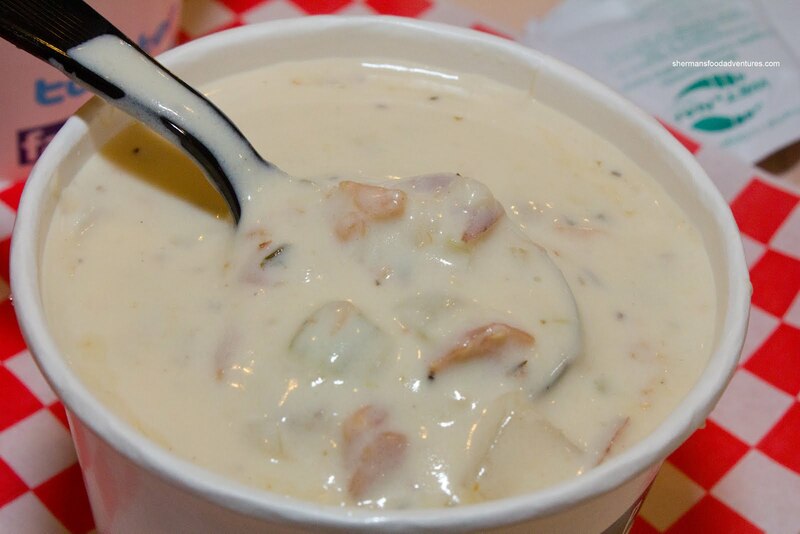 We shared 2 soups starting with the New England Clam Chowder. Just like it was before, the darn thing was sure creamy with plenty of bacon and kissed just enough by the sea. The plump clams were tender and plentiful. A very hearty and satisfying chowder. Finally an "award-winning" dish that delivered. 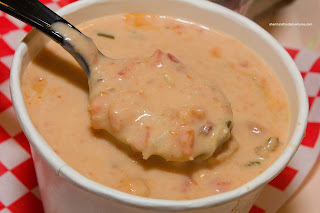 If that wasn't rich enough, we also had the Seafood Bisque. Also billed as "The Nation's Best", this also didn't disappoint. We actually thought this tomato-based soup was even more creamy than the clam chowder. One sip and I could feel my arteries clogging up, yet man was it worth it. 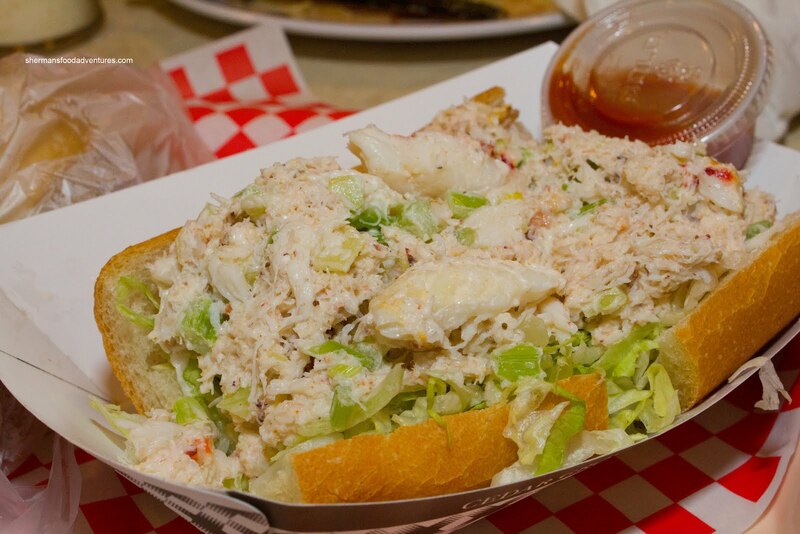 Loaded with cod, salmon, shrimp and crab, this was a meal in-itself. I'm sure some people might find it a bit heavy though. Lastly, we shared at Dungeness Crab Roll which was bursting with fluffy crab. The whole thing was light on the mayo and still a touch watery due to the abundance of lettuce and celery. Although there were hints of lemon juice, sweetness and savouriness from the crab, the horseradish cocktail sauce was needed to give the flavours a kick. In the end, we were pretty satisfied with the grub regardless of the deficiencies. Considering that it is located in an area of tourist traps, Pike Place Chowder delivers and lives up to its namesake. 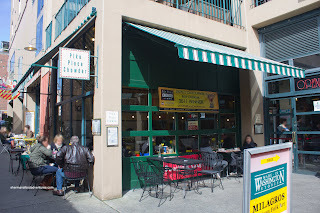 Going to Pike Place Market and not eating at Pike Place Chowder is like eating french fries without ketchup. Maybe it's a bit expensive, but at least you can be a real tourist and not regret paying the price. definitely creamy and filling!! the last time i went to pike place chowder, i got the four-chowder sampler which is nice if you want to try a variety of flavours. OMG last time I was there I had the smoked salmon chowder and I wanted to copy it and start my own chowder shop up here! THAT GOOD! @holly I agree! Gonna go back next time I'm in Seattle.